There is so much to love about ring slings. The quickness of being able to get your baby in and out, the ease of being able to discreetly breastfeed in it, having the ability to keep your carrier on your body even when you aren't wearing your baby. Or maybe the fact that you can use a ring sling from birth through toddlerhood is the selling point for you. Whatever your biggest personal "pro" is about the ring sling, there are a few things to consider when setting out to search for the perfect one for you. The ring sling was invented by Rayner and Sachi Garner, beginning its life as a padded carrier. Dr. Sears - who coined the term "babywearing" in the early 1980's - bought the design and brought it to a wider market with the publication of “The Baby Book”. Ring slings are inspired by the Mexican Rebozo carry- a carry that requires the use of a short woven wrap and is secured by a slip knot at the shoulder. The rings replace the slip knot and are the identical twin to the "d belt" that was all the rave back in the late 90's/early 2000's. Here is a breakdown of what shoudler styles are out there. Don't let this list overwhelm you! Instead, it is my hope that you are able to use it as a guide. Also, get to know your body a little bit and take advantage of any opportunity you have to test different styles. Check to see if there is a babywearing consultant or babywearing group local to you so you can get some hands on help and try on a few different types of ring slings and the other types of carriers that are available. 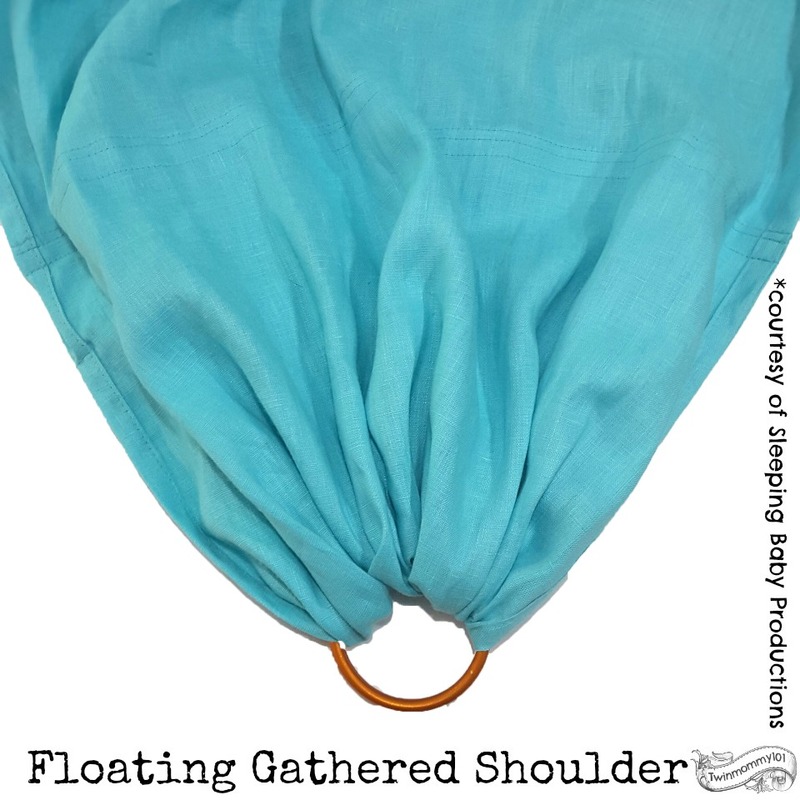 The floating gathered shoulder: Similar to the traditional gather, but the drop (the distance between the rings and where the sling is sewn) is farther up the sling. Because there is more space between the stitching and the rings, there is more fabric folded over the shoulder creating a touch of padding for the wearer, while still allowing them to have full control over how much they spread the shoulder on their body. The pleated shoulder: This is one of the most structured shoulder styles, and can be a fantastic way to show off the colors of the sling - especially when it comes to stripes! This shoulder style is also a good option for beginners, because they are less likely to become overwhelmed since the potential for having extra fabric around the shoulders is eliminated. This particular shoulder style will not cup the shoulder or go over the arm as much as other styles, leaving the wearer with a greater range of motion for their arm. The pleats can be done very narrow or broad and everything in between: It all depends on the company/person who is sewing the slings. (Note that the narrower the pleats, the less it will spread over the shoulder.) How far the drop goes (the distance between the rings and where the sling is sewn) is an important factor to consider and will determine how this sling will fit on each individual body. The pleated shoulder can be a great option for wearers who have narrow, broad, or square shoulders. This style is rather subjective because where the wearer places the rings can heavily impact how it fits them. If the rings are too low for their particular frame, it’s going to feel much too wide, and if they don’t play with it a little, they may chalk it up to “I can’t wear pleats”. Same if it’s too high. The potential downside to this style is that spreading the sling across the upper portion of the back to distribute the weight of their baby can be hindered in comparison to other shoulder styles. But again, it depends on the wearer's frame and where they place the rings. The Eesti/Hybrid shoulder (licensed to Sleeping Baby Productions-SBP): These shoulder styles are a happy mix of the above styles: with pleats on the edges to allow for a control of how far down/up the sling spreads along the end of the wearer's shoulder (where their arm and neck are), while still giving the them the control over how much the sling spread over the edges of their actual shoulder. The pleats help to keep the sling in place, while the gathered center allows the wearer more control over how their baby's weight is distributed along their back. As stated on the SBP website: "The Eesti shoulder is a modified gathered shoulder, in that some of the slings width is taken up with two small pleats on either side of the shoulder. This allows the shoulder to spread out more than my standard pleats, while keeping it somewhat more contained than a fully gathered shoulder." The padded shoulder: This shoulder style is often considered a step up in regards to comfort because of the padding in the shoulder, but as with anything it all depends on the wearer's preferences and body. The amount of padding can vary from brand to brand, however it's important to consider the impact of having any padding in the shoulder first. A padded shoulder style allows for the shoulder of the ring sling to stay spread over the shoulder. 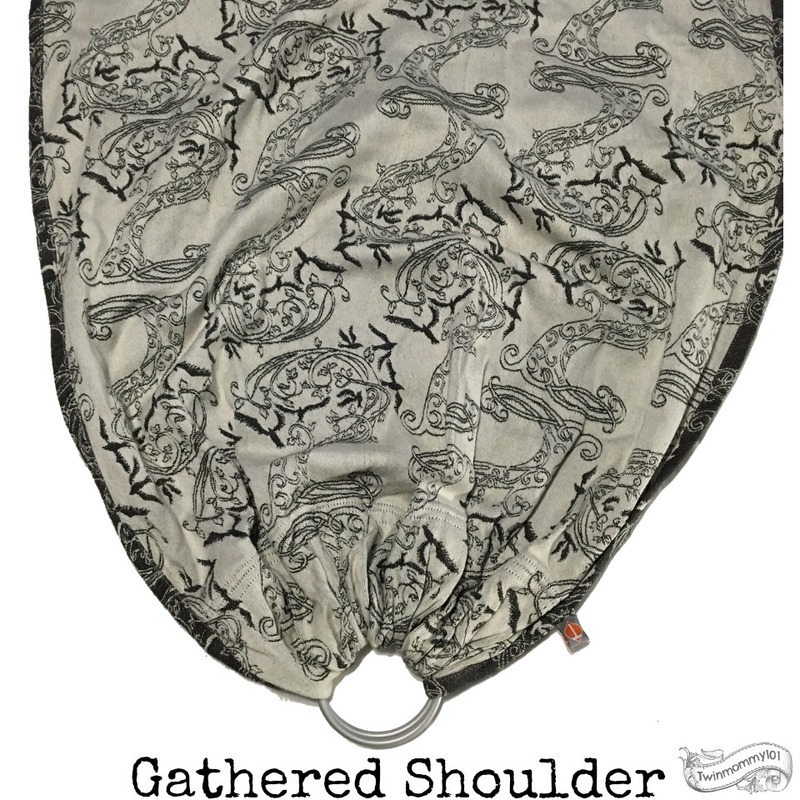 While the wearer has less control of how this carrier sits on the shoulder, they don't have to worry as much about the back of the sling not being spread. This automatic spreading of the shoulder allows for the carrier to spread more evenly across the wearer's back, which in turn distributes baby’s weight more evenly. The no-sew ring sling: This is a great way to get some bang for your buck if you have a shorter wrap. When considering a no-sew ring sling, be sure to ONLY use rings from Slingrings.com. They are the only company that has rings that have been tested and approved for the use of babywearing. (Safety first always!) Using a shorter wrap, thread the rings through the wrap and make a double layer to secure them. WATCH my friend Wrapping Rachel show you how easy it is to do! What about water ring slings? Water slings are a good way to stay hands free while in the pool or shower. Please be sure to check out the "Getting To Know Your Water Carriers" post coming soon! If you have a new ring sling, don't forget the rules about breaking your carrier in. Carriers are like jeans: at first they are super "tight" but as you wear them, they soften up and are easier to conform to your body. The one friendly disclaimer to keep in mind about ring slings is that it is a one shouldered carry. So if you have a weaker back, a heavier baby, or are tandem wearing this may not want to be your first choice for a long period of time wearing option. (We have comfortably managed to make it for at least an hour with no issues at about 30 lbs. So don't completely write off this type of carrier!) In the early days, your baby is going to be lighter, making the "one shouldered carrier" issue less important. And as you wear, your muscle memory increases making it less of an obstacle as your baby grows. And remember that keeping your sling nice and spread across your back will help the weight distributed vs it being bunched together and more likely to dig. Please be sure to subscribe to the blog so that you don't miss the upcoming posts in the "Getting To Know Your Carriers" series, as well as other fun and exciting things from Twinmommy101! Be sure to enter to win your own ring sling from Tekhni Wovens May 16-18!